Being the soap fan that I am, I just love soaps that are hand crafted. 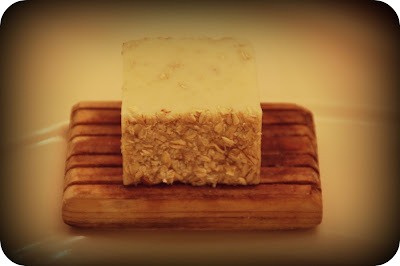 I have reviewed different types of soap here on my blog and I have to say that the home made ones are my favorites. They feel so wonderful on my skin and typically, don't leave my skin feeling dry and flaky. 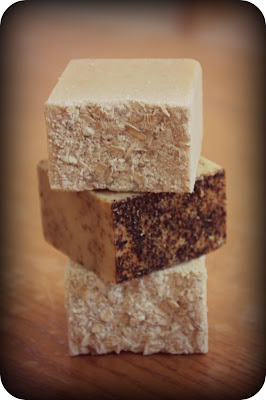 I find that when I explore the options for scents and types of soaps available, the sky is the limit...there are SO MANY different ways to make soap. 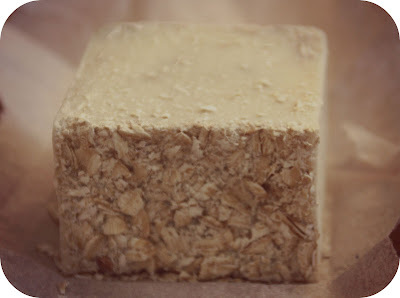 My husband thought that it would be a great idea for me to make my own soap for gifts and sure, it sounded great. In all reality though, I just don't have the time so I just buy the soap and make sure it looks like I made it myself. HA! Just kidding. :) I do love all home made soaps though and love trying out new and fresh soaps from all different types of shops. 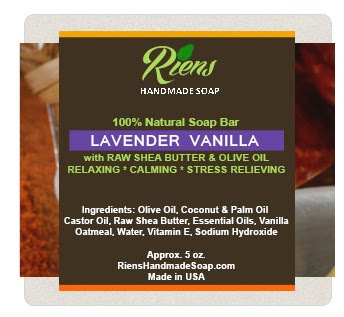 The Purpose of Riens Handmade Soap is to provide you with quality, luxury, natural body products for your skin and why, because you deserve it. We know that everything we put into our skin is absorbed so why not use nothing but the best natural ingredients that were put on the earth by nature. We have created a new line of soaps without any artificial colorants, fragrances, or chemicals. All of the colors in our handmade soaps are all natural and never artificially produced. We make our products for the benefits as it is very important to us. This is why we are truthful and careful with what we add in our bars. Again, there are absolutely NO mineral oils, sulfates, parabens, paraffin, phthalates, gluten, papa, propylene or dea in our products!! We never test our products on animals either. When it comes to all natural soaps and skin care products, you can bet your dollars that that’s what you’re going to receive from us with LOVE. Rien is the name of the owner, a wife and mother from Georgia who founded Rien Handmade Soap when searching for a cure for her family's eczema. I can totally relate to that! I have had several children with HORRIBLE eczema and it is one of the most helpless feelings to see them suffering from oozing, red and inflamed skin. I had a difficult time finding soaps to use on them that wouldn't irritate their skin and honestly, the only soaps that would work well were hand made soaps. All those added chemicals in traditional soaps are so harmful to sensitive skin...it is amazing what pure and natural soap can really do! 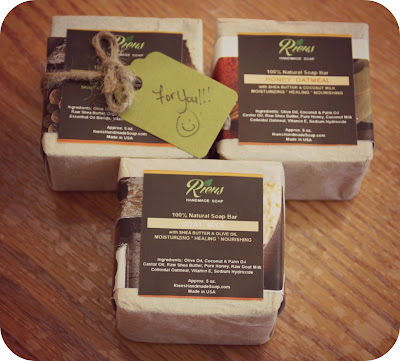 So, for this review I was thrilled to receive three bars of soap from Riens! I was sent Honey Oatmeal, Goat Milk and Herbal Green Tea Honey. Each bar is carefully wrapped in tissue paper and surrounded by a lovely label. These look so elegant and beautiful...perfect if you need a small gift for someone. 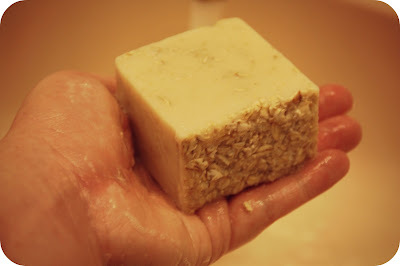 When I opened the soap, I was expecting to see a chunk of plain soap but was surprised when I saw that each bar was embedded on the ends with colloidal oatmeal or dried herbs! I thought it was a pretty and simple touch that adds so much elegance to these soaps. As far as scent goes, these aren't heavily scented--which is perfect for me. I don't want something overpowering, just enough to be able to tell what the scent is. Personally, I couldn't pick out a favorite scent in these soaps that I was sent because they all smelled so good. Earthy, homey, comforting and warm is how I would describe the smells. What I really love is that I can read all of the ingredients on the label!! Olive oils, coconut oils, Shea butters, herbs, spices, honey, colloidal oatmeal, and other simple ingredients are all combined to make amazing soap. Each bar of hand soap retails for $5. You can also purchase face and body bars, body butter and other fine products from Rien Handmade Soap company so make sure you check them out. With Christmas just a few months away, it isn't too early to start shopping...these soaps would make PERFECT stocking stuffers for anyone on your list. Also, make sure you stop by Rien Handmade Soap on Facebook and Twitter...they would love to meet you! I sure did enjoy reviewing these soaps and would definitely recommend them to anyone...simple, yet elegant and totally amazing in scent and quality.